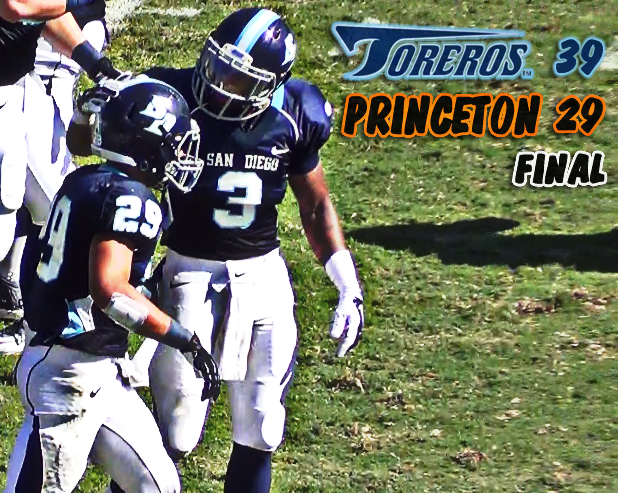 TORERO STADIUM (09/20/2014) Senior receiver Reggie Bell caught four passes for 186 yards and two touchdowns to help the San Diego Toreros (2-1) pull off a hard earned win over the visiting Princeton Tigers (0-1). Coming off a forgettable performance in last week's road loss to Jacksonville, quarterback Keith Williams threw for 277 yards and accounted for all five USD touchdowns (4 pass, 1 rush). The sophomore got the Toreros off to a 14-0 start with a 10-yard touchdown pass to Brandon White, followed by a one-yard end zone dive. Princeton answered back with two scores, but failed conversions on both kept the Toreros on top 14-12. A three-and-out gave the Tigers a chance to take the lead, but cornerback Toney Sawyer picked off Quin Epperly's pass to help set up a 29-yard touchdown from Williams to Bell, extending USD's lead to 21-12. After a 34-yard field goal cut the lead to 21-15 at halftime, the Tigers opened the first drive of the second half with a four-yard touchdown pass from Epperly to Matt Costello, giving them a 22-21 lead. That would be their first and only lead of the game. An 18-point run, that included a double pass play to Bell for a 48-yard touchdown, became too much to overcome as Princeton went on to drop their eighth straight season opener. Cornerback Jamal Agnew proved to be one of the key playmakers on defense putting up four tackles, three pass breakups, and his second interception of the season. Lineman Jamal Newman contributed with a sack and 2.5 tackles for loss. The Toreros travel to Poughkeepsie, New York next Saturday to take on the Marist Red Foxes in a PFL matchup.